Yum.... now I want pancakes for breakfast! I had not heard of this Stonewall Kitchen Pancake Mix before, but sure do want to give it a try after reading your glowing review. You have me drooling. I agree with your hubby -- I prefer Maple syrup -- so would order that extra. Oh my yes! I'll have you know I had to have pancakes for breakfast after reading this review. :-) And I'm glad I did. Hoping someone will gift me with this delicious pancake mix set. Your hubby is a keeper, for sure. Love the blueberry set! Would be happy to receive this as a gift! I love blueberries in and on my pancakes. This gift set sounds great. What a wonderful gift! 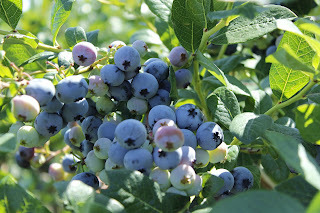 When I have fresh blueberries, I make a compote to go on top of our pancakes. I put about a cup of blueberries in a pot and cook them while I'm making the pancakes. Sometimes I add a bit of syrup to the cooking blueberries. Delicious! 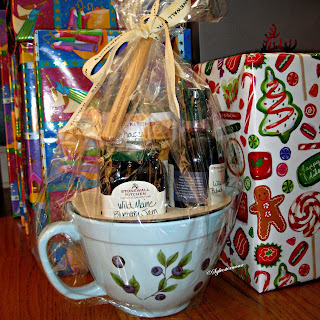 What a fantastic gift from your husband, Cynthia! I've been buying Stonewall Kitchen products for many years and have yet to find one I didn't love. Their Farmhouse Pancake and Waffle Mix is head-and-shoulders above any other brand I've tried, and it makes fabulous waffles and pancakes. In fact, two years ago I bought my brother a Cuisinart waffle iron (so good that I bought one for myself a few months later) and included the Stonewall Kitchen pancake/waffle mix and blueberry and maple syrups as part of my gift (great minds, lol!). I really love the blueberry-decorated batter bowl that came with the gift set your husband gave you. Enjoy! Cynthia, OH MY GAWD, pancakes with blueberry syrup is one of my absolute faves! I really want to try this, and it's so pretty. What a great review too. I like that bowl with the spout too, very nice. What a terrific gift idea as well. 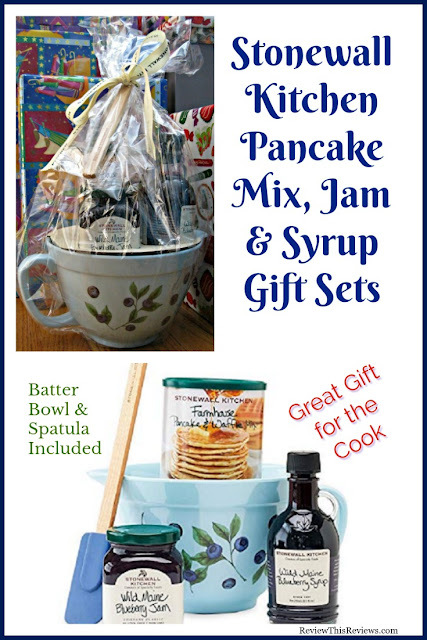 Lucky girl :) - yep, this would stonewall kitchen pancake mix and syrup would be a gift I would also love. So nice. We have a basic family homemade pancake recipe that I've been making most of my life, but once in a while hubby gets a mix that he uses to make pancakes (only I do them from scratch) - this brand sounds very good. Oh, and sometimes pancakes make a great dinner as well, we've done that. I need that blueberry syrup! YUM. Well I know what's going on my "need for the kitchen" list. This sounds wonderful and I do like my pancakes and blueberries! It's my only weakness (yeah right). Thank you for this lovely idea, I'm sure I will put it to use soon. Batter Bowl ?!?! I need one of those! Why have I never heard of them? I tend to use a really large Pyrex measuring cup but it needs to be a smidge larger to work well. Awesome post. Now I'm hungry for pancakes.